In fact, for the first time ever, the Belmopan Cycling Classic was actually finished where it started, in the capital city of Belmopan. After taking the 50-mile journey to the old capital, the Elites, Under 23 and Masters categories traversed Central American Boulevard, over the Belcan Bridge, and circled the flag monument roundabout, before retracing their path back onto the George Price Highway, and on to Belmopan, to complete the 100-mile journey. The Juniors/Youth and Females went only as far as Gracie Rock, before returning to Belmopan, for a 60-mile trek. 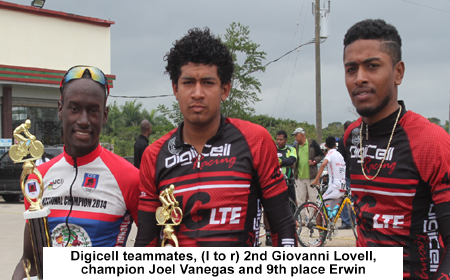 Elite/U-23/Masters: In the big Elite/U-23/Masters race, 48 started and 41 finished, with Joel Vanegas (Digicell-4G) taking top honors; actually he crossed the finish line holding hands with teammate Giovanni Lovell (Digicell-4G, both clocking 3:53.03. They were followed 36 seconds later by a group of 10, including 3rd place David Henderson (Benny’s Megabytes, 3:53:39); 4th Nissan Arana (Westrac Alliance, st); 5th Richard Santiago (Digicell-4G, st); 6th Ron Vasquez (Western Spirit, st); 7th Tarique Flowers (Benny’s Megabytes, st); 8th Robert Liam Stewart (Western Spirit, st); 9th Erwin Middleton (Digicell-4G, st); 10th Angel Tzib (Becol Uprising, st); 11th Quinton Hamilton (Unattached, st); and 12th Oscar Quiros, Jr. (Western Spirit, st). Next were solo finishers, 13th place Henry Moreira (Team Smart, 3:54:00); 14th was Delawn Abraham (Westrac Alliance, 3:54:04); 15th MEX Luis Alberto Avila Balam (Team Yapurland, 3:54:10); and 16th Joel Adan Borland (Digicell-4G, 3:54:13). He was followed almost a minute later by a huge peleton of 22 riders, all clocking at 3:55:00, and including 17th place Keion Robateau (Westrac Alliance); 18th Robert Mariano (Digicell-4G); 19th Elston Coleman (Westrac Alliance); 20th Jose Choto (C-Ray Road Addikz); 21st Shane Jones (Westrac Alliance); 22nd Kenroy “Smokes” Gladden (Unattached); 23rd Fitzgerald “Palas” Joseph (Lampaz Cycling); 24th Darnell Barrow (Team Smart); 25th Ron McKenzie (Westrac Alliance); 26th Zahir Figueroa (Becol Uprising); 27th Philton Butler (Unattached); 28th Shane Vasquez (Western Spirit); 28th Phillip Leslie (Benny’s Megabytes); 30th Brandon Morgan (Westrac Alliance); 31st Colin Maheia (Unattached); 32nd Stephen Cabral (Unattached); 33rd Leroy “Casa” Casasola (Digicell-4G); 33rd Isaiah Willacey (Unattached); 35th Herman “Hijo” Requena (Team Smart); 36th Brandon Cattouse (C-Ray Road Addikz); 37th Mark Staine (Team Smart); and 38th Jesmar Guerra (Benny’s Megabytes). After just over another half minute, a lone rider, 39th Byron Pope (Benny’s Megatyes, 3:55:43) rolled in. Next was 40th Rafael Choto (C-Ray Road Addikz, 3:56:11); and finally 41st Orson Butler (Unattached, 4:07:18). Top Masters were: 1st Robert Liam Stewart (Western Spirit); 2nd Quinton Hamilton (Unattached); and 3rd Henry Moreira (Team Smart). Females: The Female race saw 5 of 6 starters finishing, with champion Kaya Cattouse (C-Ray) out-sprinting 2nd place Alicia Thompson (Belize Bank Swoosh) to the finish line, both clocking 2:52.38. They finished a comfortable 5 minutes ahead of the other 3 finishers, 3rd place Patricia Chavarria (C-Ray Cycling, 3:00:06); 4th Gabrielle Lovell (Digicell-4G, 3:01:11); 5th Gina Lovell (Digicell-4G, 3:03:32). 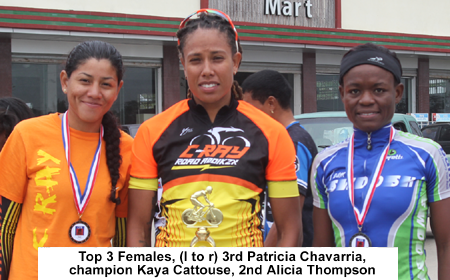 Paulita Chavarria (C-Ray Cycling) did not finish. Juniors/Youth: In the Juniors/Youths, a field of 28 youngsters started, with 20 completing the journey. 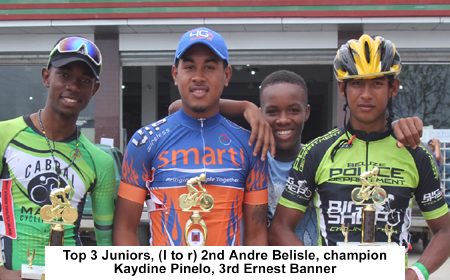 Like with the Elites, a small breakaway group of 3 riders crossed the line in 2:30.13, with 1st place going to Kaydine Pinelo (Smart Junior Cycling); 2nd Andre Belisle (Cabral/Marin Cycling), and 3rd Ernest Banner (Big Shep). They were followed 12 seconds later by a peleton of 15 cyclists, all clocking 2:30.25, including 4th place Patrick Williams (WKC Strikers); 5th Sherwin Requena (WKC Strikers); 6th Kevaughn Cacho (WKC Strikers); 7th Darien Anderson (WKC Strikers); 8th Gian Lino (Cabral/Marin Cycling); 9th Brian Sutherland (Cabral/Marin Cycling); 10th Shaun Codd (Westrac Alliance); 11th Ernest Meighan Bradley (Smart Junior); 12th Anthony Lewis (Westrac Alliance); 13th Jeshaun Fraser (WKC Strikers); 14th Shawn Armstrong, Jr. (Big Shep); 15th Gerson Lovell (Digicell-4G); 16th Juhawi Ysaguirre (WKC Strikers); 17th Shaquire Tillett (WKC Strikers); and 18th Tiajan Malique Humes (Cabral/Marin Cycling). The next cyclist rolled in almost 10 minutes later. He was 19th place Anthony Rosado, Jr. (Big Shep, 2:39:00). And the last finisher was 20th place Jevaunne Requena (Westrac Alliance, 2:48:15). 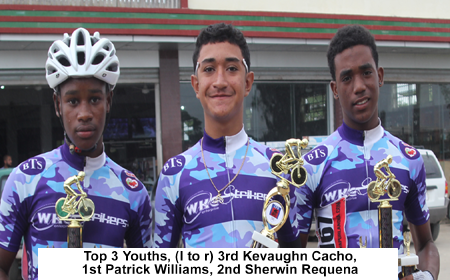 Top Youth finishers were: 1st Patrick Williams (WKC Strikers); 2nd Sherwin Requena (WKC Strikers); and 3rd Kevaughn Cacho (WKC Strikers).